HomeRight Steam Mop Giveaway | A Savings WOW! 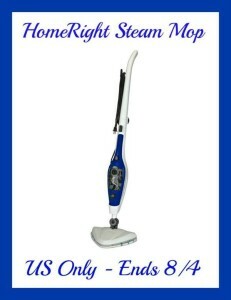 Welcome to the HomeRight Steam Mop Giveaway! Sponsored by: HomeRight and hosted by: Powered by Mom ! Make sure to read Powered by Mom’s full review here. As you can imagine, with our kids, our floors get dirty and sticky sometimes with accidental spills, so finding out about different things to help clean them up is always beneficial to us. The SteamMachine Plus Multi-Purpose Steam Mop from HomeRight is ideal for quick, daily, chemical-free cleaning. This multi-purpose steam mop heats up quickly and is great for quick daily floor cleaning. Use the SteamMachine Plus to disinfect your hard floor surfaces; such as laminate, hardwood, tile, stone, vinyl and linoleum.